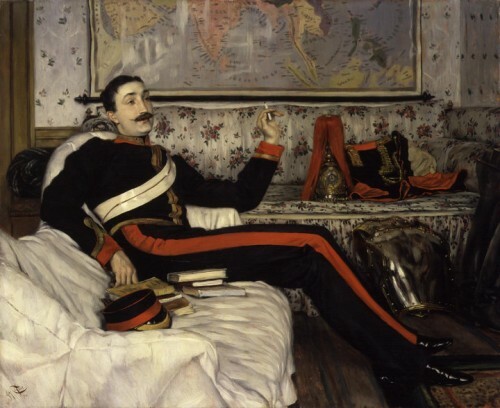 Col. Frederick Gustavus Burnaby, late of the Royal Horse Guards (the Blues), author of A Ride to Khiva: Travels and Adventures in Central Asia and On Horseback Through Asia Minor. He was also a pioneering aeronaut, author of A Ride Across the Channel: and Other Adventures in the Air. Col. Burnaby met his death in the hand-to-hand fighting of the Battle of Abu Klea, 1885. Queen Victoria fainted when she heard of his death. Captain Frederick Augustus Burnaby of the Royal Horse Guards was no ordinary officer. For a start he was a man of prodigious strength and stature. Standing six-foot-four in his stockinged feet, weighing fifteen stone, and possessing a 47 inch chest, he was reputed to be the strongest man in the British Army. Indeed, it was even said that he could carry a small pony under his arm. … Nor was this son of a country parson entirely brawn. He also displayed a remarkable gift for languages, being fluent in at least seven, including Russian, Turkish and Arabic. Finally, he was born with an insatiable appetite for adventure which he combined with a vigorous and colourful prose style. Inevitably, these two latter qualities brought him into contact with Fleet Street, with the result that during his generous annual leaves he served abroad on several occasions as a special correspondent of The Times and other journals … . From The Great Game: The Struggle for Empire in Central Asia by Peter Hopkirk. I am halfway through “A Ride to Khiva” and I am very grateful to Google Books, which provides full text, out-of-copyright books, at this point everything published before 1922. Through this wonderful service, I have been easily able to make the acquaintance of this extraordinary officer in his own prose, via Kindle. One quote from the book. 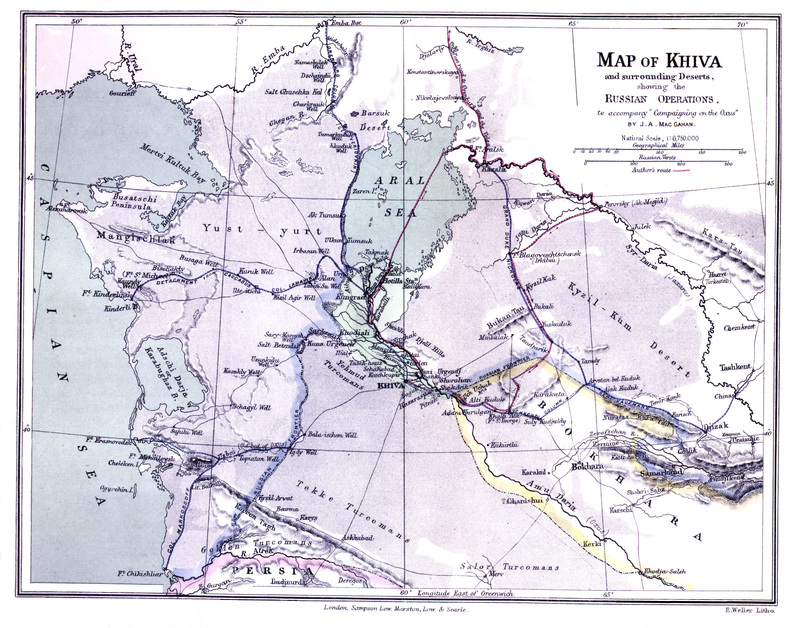 Burnaby is in St. Petersburg, and he sends a written request to the Russian Minister of War, Gen. Miliutin, asking his leave to travel across Russia and on to Khiva, which is (at that point) still beyond the Russian frontier. Miliutin responds in the negative, and offering as his explanation that he cannot answer for the security of travelers beyond the Tsar’s domains. I should have much liked to have asked Gen. Miliutin one question, and to have heard his answer — not given solemnly as the Russian Chancellor makes his promises, but face to face, as a soldier — would he, when a captain, have turned his face homeward to St. Petersburg simply because he was told by a foreign government that it could not be responsible for his safety? I do not think so; and I have a far higher opinion of the Russian officers than to imagine that they would be deterred by such an argument if used to them under circumstances similar to those in which I found myself. Burnaby, of course, goes anyway. For further details, see The Life of Colonel Fred Burnaby By Thomas Wright (1908), and The True Blue: The Life and Adventures of Colonel Fred Burnaby , by Michael Alexander (1957). This entry was posted on Sunday, April 25th, 2010 at 10:38 am	and is filed under Anglosphere, Arts & Letters, Aviation, Book Notes, Britain, History, Islam, Military Affairs, Russia, Style. You can follow any responses to this entry through the RSS 2.0 feed. Both comments and pings are currently closed. James Jacques Tissor. It’s in the National Portrait Gallery in London and makes me smile every time I see it (which is at least once a month). He looks so incredibly languorous. Sorry. That should be Tissot. Memo to self: proofread before posting not after. The contrast between the portrait, positively dandyish, and the dashing actuality of the man, is striking. The photos of him, in some of the books I linked to, show humor, even merriment. Quite a man, quite a life. Several years ago, I got a book called “Reconnoitering Central Asia”. Amazon didn’t have it. I discovered it by Googling a name from a Kipling news piece. As far as I understood the situation, I got it from the Indian version of Amazon. Rides into the wilds of Central Asia, with the object of seeing what threatened the Raj. Done on the old, coarse paper, you can practically smell the tobacco. Old line drawings. Some histories of Russian campaigns–big operations–south into Central Asia. What are the mechanics of getting books from google books onto your Kindle? Do you download it as a pdf, then go through Amazon’s service wherein you email them the pdf then they convert it into Kindle format? Chris, what I do is this. I search for out of copyright books on Google books, using the advanced search function, and clicking on full view only. This gives only complete books. When I have the book I want, I download it as a .pdf. I then save the .pdf file to my desktop. I open an email, attach the file, and then send it to my kindle. There is some small charge to put the book on the Kindle. The .pdf opens on the Kindle, but it is an image, not as electronic text. Since I have the 6″ Kindle, I have to look at the images landscape, i.e. turn the Kindle 90 degrees, so the print will be big enough to read. It takes three clicks per page, and the third click, when opening a new page can be slow. This is a little bit irritating. The 6″ Kindle was a gift, and if I had bought it myself I would have probably wanted the larger one. The larger one is bulkier but would be much better for viewing these older books on .pdf. I note you signed off Semper Fi — and I will mentions something I said to a friend who is a Marine who said he likes paper books better than any gadget. I agree, actually, and I love books. But sentimentality aside, the Kindle has a lot of utility. Particularly, I think someone in the military who had a premium on baggage might like it. You could take a whole library in your rucksack. I also recommend a reading light for use at night. I have one of these and it works fine. Richard, thanks for the tip. I got “Reconnoitering Central Asia” from Google Books. I notice that the author is somewhat disparaging of Burnaby. I agree also about the smell and feel of old books. However, an original of A Ride to Khiva is over $100. Inexpensive paperback reissues are available via Bookfinder.com. There are many, many books of this type available. The bibliography from Hopkirk’s Great Game is a good place to start. I actually don’t mind reading on the iPhone with the Kindle app. Other than having to flip pages every 2 seconds due to the tiny screen, it’s really not that bad. I’ll try to see if I can convert pdfs to the Kindle format and get them on my iPhone. My previous attempts to read pdfs on the iPhone have used one of two methods: 1) emailing it to myself and opening it up on the phone; or 2) an app called FileApp. I like the FileApp because it allows you to transfer pdfs in bulk to the iPhone using ftp. It also has a rudimentary pdf viewing capability, but it is not as easy on the eyes as the Kindle app. As for the books in the rucksack, I normally do take a library with me wherever I go. I might take your Kindle suggestion under advisement. Of course, we’re taught as Marines that “two is one, one is none,” so I’d probably end up bringing several spare paper books anyway.